A charming Bavarian-themed German village in Washington’s Cascade Mountains, Leavenworth is home to great festivals festivals, cultural attractions and warm hospitality. The lovely Front Street Park is the heartbeat of Leavenworth, offering beautiful green areas within a close proximity to shops and entertainment. 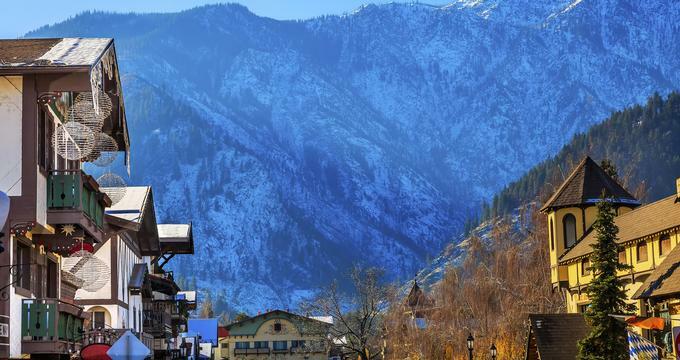 Here are the best things to do in Leavenworth, WA. 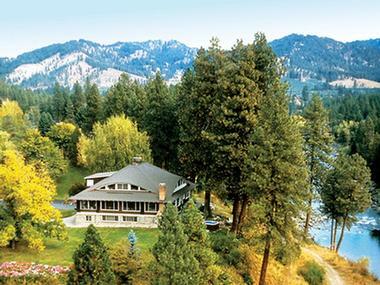 You do not have to go far from downtown Leavenworth to find an oasis of serenity and lush nature. Just downhill from Commercial Street, you will find one of the best-kept Leavenworth secrets - Waterfront Park. Follow the path that trails along the cool Wenatchee River, shaded by the quiet, dense forest. You can just sit on one of the many benches, enjoy the peaceful views and feel the stress melt away. The spring is the perfect time for birdwatching, and the fall is when the salmon make their arduous journey upstream. All along the river you will find small beaches, perfect for a quick dip in the Summer. If you want to know more about this lovely park, look out for the many informational signs posted along the path. The entire trail is about three miles of easy hiking. Only a few steps from the buzz of downtown shops, galleries and restaurants, you will find the true heart of Leavenworth - Front Street Park. With a lovely old-fashioned gazebo at its heart and a traditional Maibaum (maypole), Front Street Park offers lovely green lawns for family picnics, old trees that provide shade during the hot summer days, and endless festivals, parades, celebrations and concerts. It is as lively in the Winter as it is in the summer - you can see kids barreling down on their sleds or strolling with their parents and enjoying the enchanting Christmas lights. Front Street Park hosts “Art in the Park,” an art festival which features artists' tents exhibiting their works. The gazebo is a popular stage for performing arts or concerts and boasts a picturesque background for tourists taking photos. Who would have guessed that humans are so fond of nuts that they started inventing devices to crack them to get to the delicious morsel inside some few thousand years ago? The fascinating Leavenworth Nutcracker Museum contains more than 6,000 tools invented solely for cracking nuts, dating back to the Roman times all the way to today. They are made out of many different materials and there are a number of variations such as the tiny wooden toy soldier we recognize from the popular ballet, Asian Betel cutters, European carved wooden figures, the precious ivory, ebony and porcelains figures, the elaborate Victorian silver nutcrackers, and so many others. Some are very ornate and others are crude, but they all show the history of human ingenuity and artistry, and love for nuts. The collection, probably the biggest in the world, was gathered by George and Arlene Wagner, who opened the museum in 1995 and donated the entire collection, as well as the building, to the city. Every summer, the hills around Leavenworth come alive with happy theatre goers who wait the whole year for this theatrical treat. The Leavenworth Summer Theater started in 1994 as a vision of Bill Weis and Susan and John Wagner. Their idea to put together world-class artists with a world-class venue resulted in the biggest summer theatre between Spokane and Seattle. Two of the venues are under the stars: Ski Hill Amphitheater and Hatchery Park Stage. One is in the downtown air-conditioned Festhalle Theater. Some of the shows, such as Sound of Music, are so popular and well received that families make it an annual family pilgrimage to come to Leavenworth to attend it. It is not unusual that more than 20,000 people attend the festival during the two summer months. 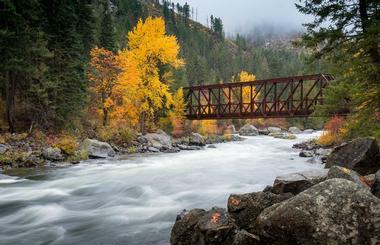 About 16 miles from downtown Leavenworth, you will find the trailhead for the Icicle Gorge Trail, a well-travelled, popular trail in the magnificent Okanogan-Wenatchee National Forest. 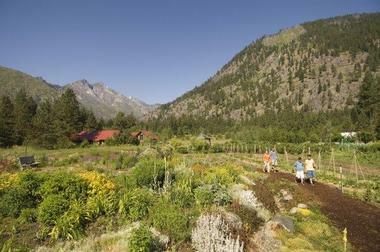 Hiking this easy trailis a great way to spend a day enjoying the breathtaking beauty of the Icicle Creek Valley. The trail offers fantastic views of Icicle Gorge, the turbulent and rapid Icicle Creek and the surrounding mature forest filled with birds and wildlife. The trail follows the creek on both banks, one fairly bare and other densely forested. There is a small bridge about half way, a perfect spot to enjoy the view and take some great photos. The entire loop takes about three hours and even kids will find it fun. You will not see many icicles, the name came from the poor pronunciation of the native name of the creek - Nasikelt. A part of Sleeping Lady, the beautiful luxury mountain resort about 3.4 miles from Leavenworth in the Wenatchee Valley, the Organic Garden is a serene place where resort guests can take a stroll, relax on a bench to enjoy birds and wildlife, or have a cup of tea in the lovely gazebo. The Organic Garden is a fully certified produce, flower and herb garden on 2 acres of fertile grounds surrounded by a magnificent mountain backdrop. 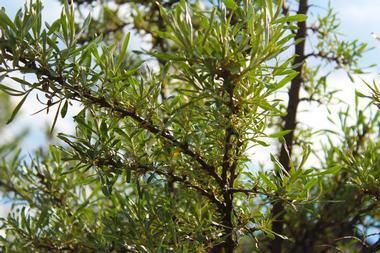 Everything that grows in the garden is used in Sleeping Lady's restaurants and hotel. The garden has been certified organic by the Washington State Department of Agriculture and it follows strict organic gardening techniques such as using natural fertilizers, rotating crops regularly to improve the soil and introducing beneficial insects such as bees and ladybugs for pollination and natural pest control. 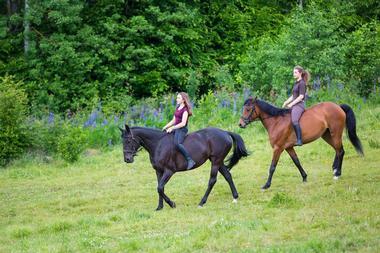 Eagle Creek Ranch is a family-owned and operated, four-season horse ranch that can be found amidst the Cascade Mountains. The historic ranch is surrounded by one of Washington's greatest outdoor nature preserves, the Wenatchee National Forest. Guests can explore the ranch as well as the national forest on a horseback ride through the forested foothills during the spring and fall. In the winter, the ranch transforms into a scenic valley that can be experienced on a horse-drawn sleigh. The experience is fun for the entire family and beginners will be given a basic course before they begin while children can ride rope-led horses. Since 1982, Leavenworth Ski Hill has been a central location for winter activities in the area. Families flock here for the affordable, and sometimes free, activities and events. 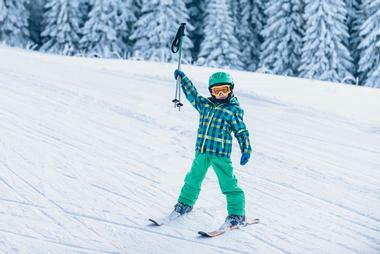 Local children start learning young with the many skiing programs that are offered, and visitors from all over come to create memories in the historic Ski Hill Lodge. Other than skiing and snowboarding, guests can snowshoe, enjoy the only ski jump on the west coast, or visit the Lt Michael Adams Tubing Park for some tubing fun! The extensive interconnected trails combined with modern facilities make for a world-class Alpine and Nordic experience at Leavenworth. Dating back to the 1800s, Mountain Springs Lodge is steeped in family heritage and rich tradition, making it a centerpiece to the pristine natural beauty that surrounds it. Renovated and introduced as the Mountain Springs Lodge and Conference Center in 1990, visitors travel from far and wide to experience the lodge and its history. Retaining the panoramic view of the high Cascades and the openness of the vast meadows around it, the lodge blends in with its environment. Visitors can enjoy themselves by relaxing at the lodge, cooling off in the rock-sculptured pool, walking through the meadows, horseback riding through the forest groves, or hiking through the wilderness trails. The lodge can accommodate fly-fishing lessons, tubing, kayaking, and rafting alongside partner companies. 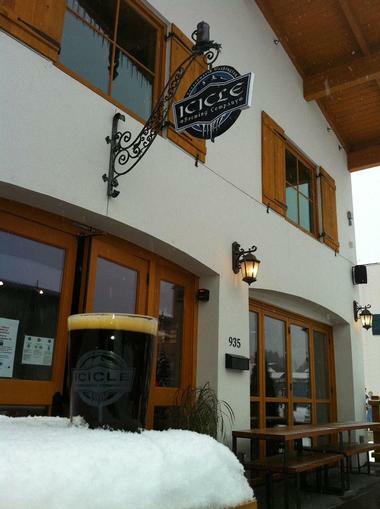 Those interested in the beer brewing process will enjoy a visit to Icicle Brewing Co. in downtown Leavenworth where you can taste some really good local brews while seeing how they're made. Head brewer Dean Priebe is the magician behind the brewery and he has managed to combine the clear, pure waters of the Icicle River with fresh, carefully picked ingredients, to come up with delicious and original lagers and ales. Relax on their light, pleasant outdoor patio or in the rustic tasting room, and watch the magic happen in the Company Production Facility just across the room. Watch the stainless steel tanks that are full of future ale or lager and imagine under your feet the cool cavern storing already made beer. Feel free to ask questions, or even better, have a seat at the bar, try a few different brews, grab some of the pub's locally sourced dishes or enjoy one of the many regular events at the pub. Listed on the National Historical Register, Penstock Trail was a huge water pipe that delivered water from the raging Wenatchee River to a powerhouse for electricity-powered engines that replaced coal-fire engines to pull trains. Visitors can now hike up the trail to experience one of Washington's finest environments, viewing not only the Wenatchee River, but Tumwater Canyon as well. The trail is fairly easy even for new hikers and it should take around one hour to cover the two-mile round trip distance. Icicle Outfitters and Guides guarantees a western-style adventure that will have visitors completely forget about their 9 to 5 jobs, rush hour traffic, and even their cell phones! Tours are of the picturesque countryside of Leavenworth and take visitors through serene valleys, meadows, and deep blue skies while shaded by the majestic Cascade Mountains. All visitors need are a sleeping bag and their personal effects - Icicle Outfitters handles the rest with packages to explore the alpine country by horseback or spend the night with a full-service deluxe camping experience. 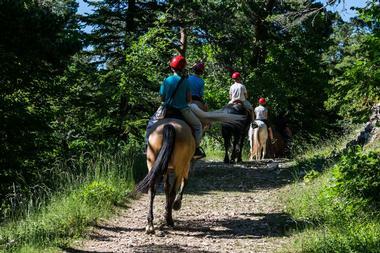 Summer trail rides, high lake fishing, pack trips, hiking trips, fall hunting trips, and winter sleigh rides are some of the available activities. A century old structure that was once home to the family of the town banker and a former bed and breakfast now houses the Upper Valley Museum at Leavenworth. The museum, also known as River Haus, sits on 8acres of property that comprise the Barn Beach Reserve and offers views of the Wenatchee River. Guests can explore the museum and the surrounding area which is rich in history, as seen in the artifacts and exhibits on display. There are permanent and rotating exhibits dedicated to the Bavarian-theme village of Leavenworth and its history; there are also special exhibits which are displayed during town festivals and events. One of three hatcheries in the area, the Leavenworth National Fish Hatchery came to be when the Grand Coulee Dam was constructed in the 1930s. Though the dam was a necessity, it impacted the many fish that swam down the Columbia River as it closed off hundreds of miles of river. 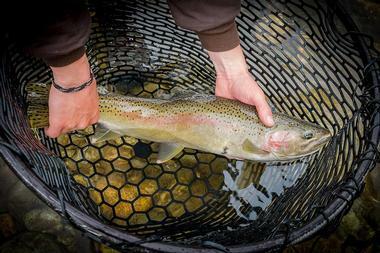 As mitigation for the dam's impact, the three hatcheries were constructed in an effort to compensate for lost habitat, as well as serve commercial and sport fisheries by keeping the fish numbers high. Visitors can now tour the hatcheries and understand their operations and history - each of the hatcheries have been running for the past 75 years and raise spring Chinook salmon, summer Chinook salmon, coho and steelheads. 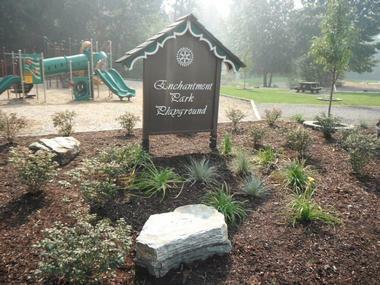 Enchantment Park is a sports complex in Leavenworth, Washington dedicated to providing the community and its visitors a safe and educational place to play various sports, including but not limited to, softball, baseball and soccer. The park now has a playground, two softball fields, and a junior baseball field, as well as restrooms and changing rooms. Visitors are encouraged to participate in the many activities or walk or bike the trails that loop Leavenworth's scenic Waterfront Park recreational area. The park interconnects with many other trails as well as the Wenatchee River waterfront environment and Blackbird Island; visitors may be able to view deer, beaver, several species of fish and birds, as well as the occasional bear or cougar. 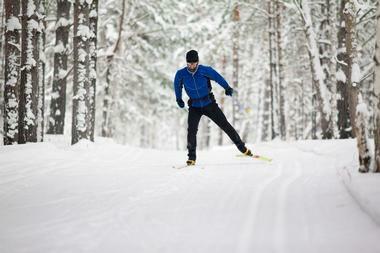 Starting in downtown Plain, Washington, Plain Valley Nordic Ski Trails is a cross country ski trail system with over 16,000 miles of groomed cross country skate and ski trails. Out in the vast open skies, visitors get an amazing view of Plain Valley as well as the opportunity to go snowmobiling, sledding, tubing, sleigh riding or ice skating. Events and activities such as snowmobiling tours, wine tastings, and a backcountry ski camp are also on offer. Lodging, dining and equipment rentals are some of the facilities on-site. Beginner visitors can sign up for lessons in classic track skiing or ice skating while others can join in on the fun with the many teams, programs and camps available. Established in 1991, the Osprey Rafting Company comprises a team of professional guides with years of experience whitewater rafting down the Wenatchee River. It is the only company in the area to offer guests a ride down class 4 rapids through their private High Adventure route directly on the river, and they take great pride in making sure that visitors have the most amazing, exciting trip - even if it's their very first time. For those who want to enjoy the water but are not too keen on the rapids, paddle boards, tubes and kayaks are available to rent. After the tiring but fun day, guests can reenergize at the company's private beach and restaurant, Huck's Landing. Boasting one of the best and oldest golf courses in the northwest, the Leavenworth Golf Club offers guests so much more than a round of golf. Established in 1927, the golf club grew over the years; what started as a 9-hole course is now an extensive 18-hole all grass course. Visitors who come to the club will enjoy an amazing view of the mountains, the Wenatchee and Icicle Rivers, and the wildlife that surrounds the area. The club house is a great place for visitors to relax and unwind in the spa/ fitness center or to shop for souvenirs and golf merchandise from the club shop. 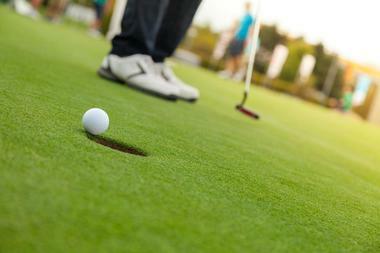 The atmosphere of the Leavenworth Golf Club is perfect for cocktails, dinners and events throughout the year. A magical place with crystal blue lakes and flowing creeks atop a naturally created alpine environment shaped by glaciers, the wind and waters, Enchantment Lake is truly enchanting. 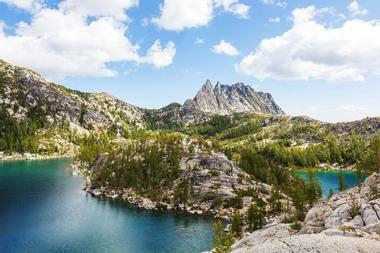 Witnessing the natural beauty is no easy feat, visitors who are interested will have to hike at least seven miles at a 4,400 foot elevation to reach the very first lake in the Upper Enchantments. There are many trails that could lead visitors depending on whether they prefer a day hike or an overnight hike - overnight permits are necessary for the latter. Common trails include Snow Lakes or Stuart Lake trailheads and guides are available for those who prefer one. Adventurous visitors, both beginner and expert, will have a wonderful time with the Northwest Mountain School in Leavenworth, Washington. The IFMGA licensed guides have over 40 years of combined experience and offer alpine mountaineering, ski mountaineering, rock climbing trips and touring adventures. There are many small and customized programs led by AMGA certified rock, alpine and ski guides, as well as multiple extended expeditions to Europe, Antarctica, South America and Alaska. One of the only family owned mountaineering schools, there are many classes for beginners to take their first steps toward appreciating the great outdoors. 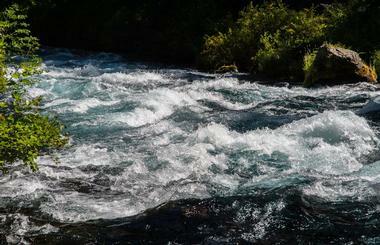 Orion Expeditions offers family river rafting adventures like no other. The full-service, professional river outfitters have various packages to meet a visitor's needs and are well-suited for all ages. On offer are introductory white water rafting tours for beginners, challenging tours for experts, team-building tours for company outings, and beginner tours for younger visitors who are just starting out. All of the guides are trained and experienced individuals who keep safety in mind and the rafting equipment at Orion Expeditions is guaranteed state-of-the-art safe. The raft trips take visitors through the North Central Cascades and other breathtaking sites through Leavenworth, Mount Rainier, or Seattle. 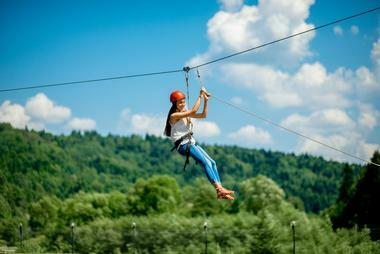 To experience a unique side of Leavenworth, zip from ridge to ridge with Leavenworth Ziplines. With eight different ziplines to choose from and two suspension bridges all over 190' above the valley floor, Leavenworth Ziplines guarantees a fun and amazing time to all its visitors. The ziplines are located in the Cascades' forests, allowing visitors to zip over the canyon, trees and the breathtaking natural beauty found there, safely assisted by certified guides. Perfect for all ages, it's a family or team experience in Leavenworth that can't be found anywhere else.